Often, we liken cafés to living rooms due to their hospitable decorum. To apply that comparison to a concert floor, however, is much less precedented. On an overcast summer evening, I arrived at Sunset Terrace, an independently operated gallery in East Vancouver, to find an impressive makeshift tent fashioned from tarps, rope and planks of wood. Beneath the tent was a selection of inviting armchairs, stools, and ottomans stationed upon Mexican blankets strewn like area rugs where audiences could sit crossed-legged for the evening’s lineup. Chandra Melting-Tallow and Stefana Fratila accompanied by cellist Thomas Wiedeman delivered varied musical sets from the gape of a loading bay in the rear of the gallery. 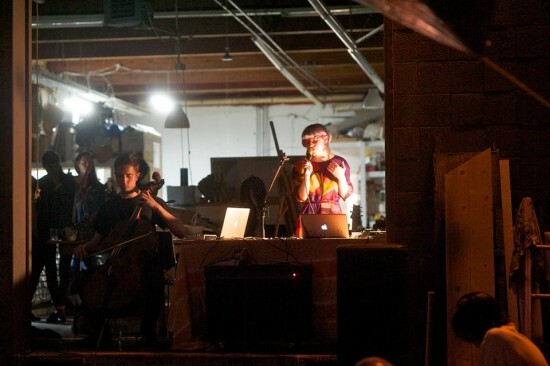 These musicians were assembled by Soledad Muñoz, a Canadian-Chilean artist living in Vancouver working notably with textiles and sound, who launched a new record label that evening, Genero Sound. While the label itself is primarily occupied with creating opportunities in the field of sound and music performance for female musicians, Muñoz considers conversation almost as integral to Genero as sound itself. Genero’s “About” page in indicative of the tenor of the project. If what you seek when landing on the page is a tidy, lucid paragraph that will summarize the record label’s activities and intentions, you will find instead a rotation of transcriptions of conversations between her and women in her community. Currently the page hosts a conversation with Katrina Niebergal, her studio mate at Sunset Terrace. In the transcription, Niebergal is asking chief questions that we might expect to be addressed in a paragraph ‘about’ Genero. KN – To start this conversation off maybe you should tell me again what Genero is and explain the meaning behind the name. SM – Genero is a project- I think to call it an audio specific project would be fair. Naming a thing is very tricky…I think of it as a place where women can find women within the sound realm. And Genero in Spanish means textile, and genre, and gender as in to generate in the singular; so Yo genero – I generate. Following a moment of shared enthusiasm for artist Judy Chicago and feminist theorist bell hooks, who recently made headlines by declaring Beyonce a terrorist, Niebergal asked, “How do you think about feminism?” She granted that it is a complicated question to answer but Muñoz replied straightforwardly. “It’s super easy,” she said. “To me, it’s just about equality and difference.” But being “about equality and difference” can apply to just about anything from building team spirit to sharing the road, and, if it’s easy, why was she not more specific? The complication Niebergal acknowledged in answering the question of how one thinks of feminism does not lie in the challenge of doing it concisely, confidently, or easily, but rather in the process of identifying voids. Identifying voids in the fabric of society is akin to choosing a hole in a pair of fishnet stockings and calling it the most pertinent hole in the garment. A lack of specificity could be perceived as a marker of a fledgling endeavor, but an abundance of it could be construed as privileging a single issue. When asked again why Genero only signs female artists, (just another rendition on the general “but what about men?” inquiry) she responded: “I don’t even think that [excluding men] is even their biggest concern. I think it’s more ‘Why call it this?’ or ‘Why identify as that?’ I think it’s because they’re afraid that doing so would reinforce a binary…I am not advocating for women to be better than men…It’s like when I advocate for Latinos, it is not for Latino supremacy, you know?” When inclinations are in favor of shredding the whole garment, a series of valid questions subsequently tasked to feminists might be: “GREAT! Now, what do we wear instead of fishnet, and what if I don’t want to wear what you want to wear?” Muñoz’s answer would likely be to wear whatever you want, which is not exactly more or less specific than what she might have meant by “equality” and “difference” but it certainly suggests the importance of personal agency and personhood in the pursuit of equality. When listening to the music or researching the musicians of Genero, neither the music nor the musicians are explicitly political in presentation. Fratila’s songs have mined totalitarian history with “Nero” about Roman Emperor, archetype of tyranny and reputed anti-Christ according to certain scriptures of the Bible, as well as given homage to the phenomenon of boyats, Arab women who cross-dress beneath their burkas. Melting-Tallow identifies as a performing artist and musician of the Siksika Nation and the titles of her songs, “Eidolon” and “Ishtar” refer to apparitions in Greek literature and the Babylonian Goddess of love, war, sexuality, and fertility. Genero seems less collectively enthused to ostracize men and more likely to foster female solidarity through mutual objectives to produce and distribute sound projects by women. Though it is uncertain if Genero’s philosophy is operating on a lack or abundance of specificity, Muñoz is not adverse to working with active contradictions. “We want to be hosting speakers that have little in common, with different points of views on what feminism is, on how they define and think about the body, etc. That’s what’s interesting to me; not just having yes-yes conversations where you’re continually agreeing with everyone around you but yes-no conversations to, where you’re really communicating and challenging each other.” Contradictions seem to embolden her to sustain difference, so that the possibility of a generative dialogue, or yes-no conversation, can occur between the women who come into contact with Genero. Consider that in the arena of conversation between two people, a “yes-no” conversation visually demonstrates, through the presence of opposites, more equality than a “yes-yes” conversation, as the latter can only confirm consensus. Without the presence of an opposite, there is no possibility of difference, thus no possibility of inequality. 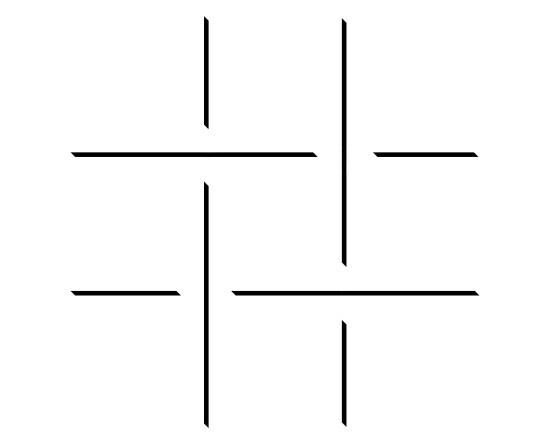 But difference is inevitable—in the apparent absence of difference, it is likely repressed or hidden by the illusion of a homogenized ideology, or a false utopia. In a New York Times opinion piece, “The Myth of Male Decline”, Stephanie Coontz, sociologist and professor of family history at Evergreen State College, contested ‘the end of men’ as a miscalculated myth and exaggeration of the ascent of women: “These books and the cultural anxiety they represent reflect, but exaggerate, a transformation in the distribution of power over the past half-century. Fifty years ago, every male American was entitled to what the sociologist R. W. Connell called a “patriarchal dividend” — a lifelong affirmative-action program for men… The curtailment of such male entitlements and the expansion of women’s legal and economic rights have transformed American life, but they have hardly produced a matriarchy.” Coontz’s opinion piece was published shortly following the release of “The End of Men” on September 11, 2012. A history of dissonance is integral to sustaining discourse in any field. Outside a café on a Friday afternoon, Muñoz and I were playing nicely, recording a conversation to be transcribed and hosted on Genero’s website. Initially, we were talking about why I wouldn’t choose to live in Montreal, she recently returned from living in New York where she worked as an intern at a commercial gallery, and we commiserated about the similarities and differences between the west and east coast. This led into a discussion about what ratios of preconceived experience to physical presence constitute a positive encounter with artworks. During the conversation, I felt distressed by the prospect of anyone reading or listening to our esoteric exchange upheld by our pleasantries as colleagues. We were having what she termed a “yes-yes” conversation. At last, we arrived at the subject of Beyoncé and her effect on young girls, when we began having a “yes-no” conversation. Relief washed over me when it became clear that she and I are fundamentally divided on the Beyoncé-is-a-terrorist debate. Giorgio Agamben, “Notes on Gesture” from Infancy and History: The Destruction of Experience. Verso (London: 2007): 140. 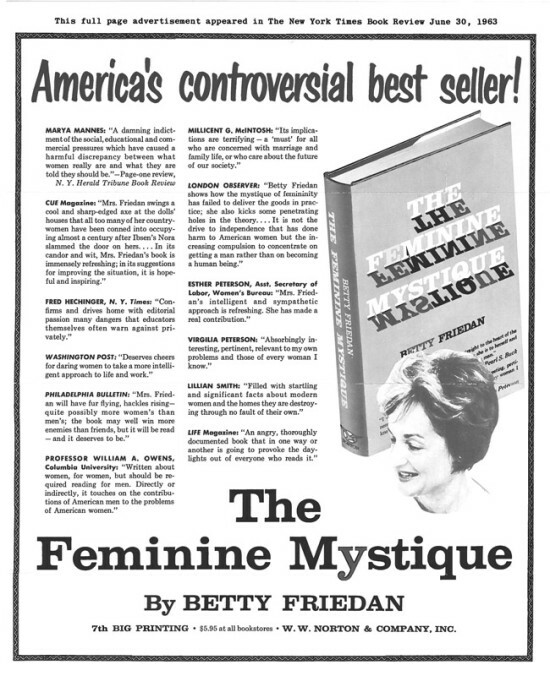 Betty Friedan “The Happy Housewife Heroine” from The Feminine Mystique. W.W. Norton and Co. (New York: 1963) 42. Posted in Art & Culture, Uncategorized. Bookmark the permalink.